Maybe, someday in the future, we’ll look at this past decade of Oilers hockey and laugh. Maybe someday, Edmontoners will look back at these years and smile, as the plethora of top draft picks year after year of last place finishes has netted the franchise transforms them into the leagues next dynasty. Rest assured, no one is smiling or laughing right now. Through the first 13 games of the season with McDavid, Edmonton had won 5 games. Not exactly a blistering pace, but no one—not even head coach Todd McLellan—viewed these Oilers has a one year fix. For a team that has won under 25 games two of the past three seasons, 5 out of 13 counts as a blistering start. 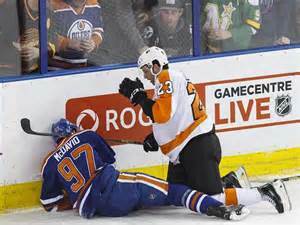 But now, with Connor McDavid out “months” with a broken clavicle, the good feeling in Edmonton is gone. Forgetting for a second that this is a devastating blow to the NHL—which has been gearing up all season to market the McDavid-Eichel race for the Calder as the heir apparent to the Crosby-Ovechkin rivalry—the Oilers, a team that lacks depth, just lost their second line center and arguably their best player outside of Taylor Hall. Through 13 games, McDavid was tied for second on the team in goals (5), and trailed only Hall in points with 12. At just 18, and still adjusting to the physical rigors of playing against grown men every night, it’s fair to say there’s every reason to believe McDavid’s best performances this season were still to come, despite scoring at just below a point per game pace already. The Oilers, at this early stage of their development, need to outscore opponents to win. With a young, mistake-prone corp, and an unproven goaltender, there won’t be many nights this group can eek out a 2-1 win, and with McDavid out, finding 3 goals per game just became a much more daunting task. At some point, Edmonton—already with four number one overall picks on their roster—needs to take a step forward. The playoffs were never a realistic goal for this season, but inching back towards respectability and the .500 mark was. Now, without their latest number one pick for the foreseeable future, they could be lottery bound yet again—an unappetizing proposition in Oilers country, and one that would only be palatable if the ping pong balls again go their way in June, and hockey’s next next big thing—Auston Matthews—ends up donning Edmonton blue.